Democratic Farmer Labor Congressman Jim Oberstar, (DFL-Minnesota), who died last week at age 79, became the Iron Range Congressional representative in D.C. about at the same time I moved from Minnesota to California. 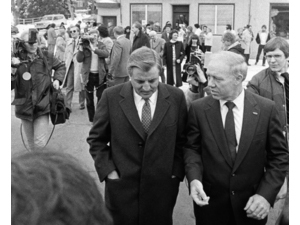 Oberstar was the longest serving Congressional representative in Minnesota history. He was the son of an iron miner in northern Minnesota where I was born and grew up. I never met him. 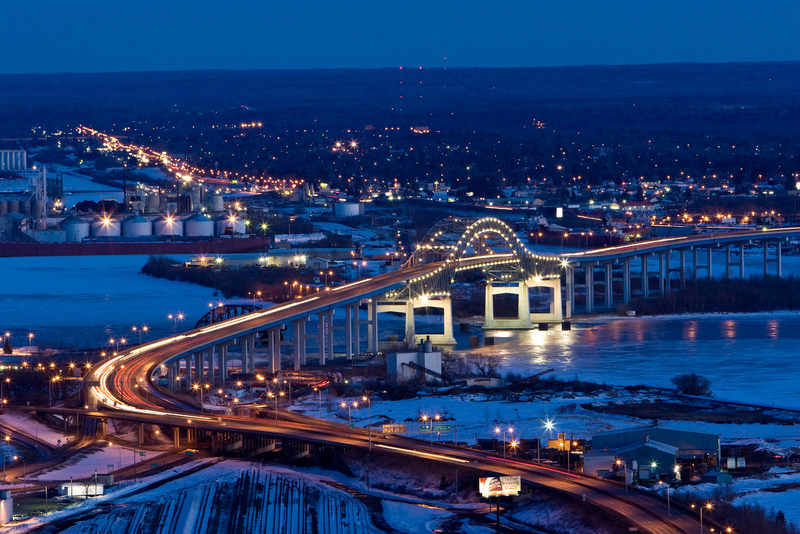 The Iron Range is a region northwest of Duluth just below the Canadian border that produced the largest white pine lumber supply in American history at the turn of the century (Paul Bunyan territory). After clear-cutting every tree in the region lumberjacks changed jobs and began harvesting the largest supply of pure iron ore in the world’s history. The Iron Range mines (three ranges, actually – Mesabi, Cuyuna and Vermillion), whose rights were quickly bought up by Eastern Wall Street types like the Rockefellers, were one of the biggest sources of wealth that created the manufacturing and building prowess of America. Historically the lumber and mining workers were at the forefront of American organizing throughout the entire 20th century – from the Industrial Workers of the World to the steelworkers, coalminers, construction trades and others. 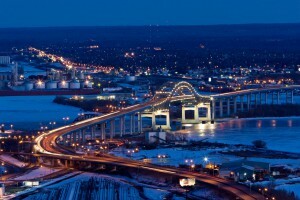 But in Minnesota, and the Iron Range in particular – progressive worker organizing and political will – iron ore mining became the resource which produced the sizeable tax base and collective bargaining that created the American Dream of good housing, public education, affordable health care, municipal power and water, and retirement income. The workers and legislators who created the political base of the DFL in the middle of the 20th century made Minnesota the finest example of aggressive middle class prosperity in America. That’s the childhood and high school years of my Minnesota. Ultimately that high-grade iron ore – like lumber – was exhausted by the mid-1980’s though there still are pockets of low-grade ore mining throughout the region. The area is turning more to tourism, the towns have shrunk, and there has become more crime and poverty. Yet despite the downturn the workers with the United Steelworkers and other unions still have a voice at work with union-negotiated salaries. From far away in San Francisco I can see that labor unions, community groups and DFL legislators are still fighting in the 21st century for good jobs and a voice at work in campaigns like the recent victory to raise Minnesota’s minimum wage. When I grew up and attended high school in northern Minnesota our parents had a voice at work by being in a union. The majority owned a house, and all had health care coverage. We had construction training in our junior and senior years of high school. And, as I now know from my dad’s pension (he worked for the Minnesota Highway Department and was an AFSCME member) there was a real defined benefit pension that my mother can now live on in her older age with guaranteed payments. These benefits a standard to what became Social Security, a benefit that Minnesotans helped import legislatively to D.C. through our DFL Congressmen and Senators to ensure that all Americans have a safety net when they are old and unemployed. Jim Oberstar (1974-2010) succeeded Congressman John Blatnik (1952-1974), whose name graces the Blatnik Bridge from Duluth to Superior, Wisconsin across St. Louis Bay, a bridge that ultimately linked the Twin Ports as well as their careers as Congressional Chairs of Transportation and Infrastructure and Public Works Committees in the House. It was a big thing watching the building of that bridge whenever we drove to Duluth from my hometown of Virginia, the Queen City of the Iron Range, in the 1970’s when my parents dragged me into the car down Hwy 53 for the hour-long drive to Duluth to shop at the first low cost Target store invented and launched by the union-run Dayton-Hudson department store chain. A 1960’s invention for why Minnesota has to raise the minimum wage. Blatnik and Oberstar were what I will call blue dog DFL Democrats who fought for workforce and transportation investment, highways, shipping, airports, mining investments in the best ways of support for American jobs. Oberstar was the chair of the House transportation committee until his inexplicable loss during the Tea Party rebellion of 2010 that has made the United States Congress the laughing stock of the world. They had some flaws: Oberstar was anti-abortion. Blatnik voted against the Civil Rights Act of 1965. But with the knuckleheads in control of the Republican Party in Congress we still wish they were around. Like a recent former DFL governor, Rudy Perpich, they were both from Chisholm, a small mining town on Highway 169, between Hibbing and Virginia. It is no coincidence that in the 1980’s the Iron Range research center and tourist attraction, Iron World, were built in Chisholm, a regional and national treasure of Minnesota history. Oberstar and Blatnik never were part of the national political stage like other Minnesota Farmer Labor Democrats – Hubert Humphrey, Walter Mondale, and Eugene McCarthy – all who taught at Macalester college in St. Paul during the era when I aimlessly happened to get a degree in Political Science and Economics. But they come from the same trade union based culture that understood the 20th century progressive value of responsible government. Even into 2010 Congressman Oberstar was still a true DFL’er before the concept of “business democrat” gnawed its way into the national and state Democratic parties. When I was a senior at Roosevelt High School in Virginia, Minnesota I was captain of the ski team. I raced slalom and Virginia did well in Iron Range Conference meets at our own Lookout Mountain, Giants Ridge in Biwabik and some hills in Ely. But to compete at the Minnesota State Championships in Cloquet we were required to have a ski jumping division. Virginia didn’t have a ski jumping division. We didn’t have any ski jumpers. The last ski jumper in town had graduated years earlier, so as captain of the team, I decided I would become a ski jumper. Coach sent in the paperwork. As we all know, Senator Paul Wellstone’s plane crashed on the way to Virginia to attend the funeral of State Legislator Tommy Rukavina’s father. A funeral on the way to a funeral. 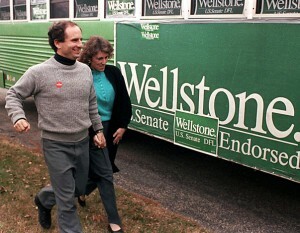 I’d mourned Paul Wellstone’s death from the bottom of my heart. The values that he and his wife represented were the same values I took away with me to California when I didn’t want to leave Minnesota any more than I wanted to be a ski jumper. If I’d stayed in Minnesota I would’ve been working with Wellstone, and maybe even Tommy Rukavina, (Tommy the Commie, the state legislator and best friend of workers in northern Minnesota history, I’m told, and who I would’ve been proud to work with) the same way I work with California leaders such as Nancy Pelosi, a fellow San Franciscan who is now the first woman to lead a party in Congress, Tom Lantos, the veteran San Mateo and San Francisco Congressman who championed workers’ democratic rights to collective bargaining and health care, and his successor Jackie Speier who is a national champion for women’s rights and protection from abuse. I’ve never met Tommy Rukavina. Like Paul Wellstone, all of these leaders understand why democratic government in America exists: to ensure that everybody has access to economic opportunity and education; that no mayor or governor or corporation calls all the shots. All good leaders understand that the fight is complicated and that polarization between corporate and community interests seems to never subside. But they also know, like all political leaders in Minnesota have to know, that without labor unions and public servants who seek office to protect community and family interests, we could easily end up as another Iraq or Nigeria, a nation or state controlled by a conquering elite. Since the 1850’s both California and Minnesota have suffered the antagonisms of partisan elections yet endured a semblance of pluralistic peace. For this reason I’m proud to be a Minnesotan and a Californian. Paul Wellstone’s life was a political gathering. The family and friends who attended the service were community and political activists. They were talking about obscene health care costs and layoffs and homelessness. Their activism was what they practiced at home and in Washington and at hockey games and holidays and funerals and, of course, on the bus. They wouldn’t sit around and mope. But, like all of us, they would mourn, get angry at egotists like Jesse Ventura and Norm Coleman, and talk about Paul’s life. The last time I flew home to Virginia from San Francisco was also about ten years ago, when my father died. I rented a car in Duluth. It had been a while since I’d been in Virginia so I was surprised to still see a Senator Wellstone banner on Second Avenue just off Chestnut Street. Despite the sadness of burying my father it made me feel extra welcome to see Paul’s presence in my hometown. I also noticed a lot of UNION YES bumper stickers. When I lived in Virginia we didn’t need bumper stickers to be proud to belong to a labor union. Part of the reason I left Minnesota for California was because of the personal and ideological post-1960’s reactionary rhetoric most provocatively analyzed in a book by an unknown political writer named Kevin Phillips. The book was entitled “The Emerging Republican Majority,” which quickly became known as the “The Political Bible of the Nixon Era.” The core of the ideological reaction that Philips, intelligently, but unwittingly, identified was an American selfishness and racism that was reacting to an increasing corporate-fueled disparity between the “Haves and Have-Nots.” Most of the analysis dealt with the voting patterns of the southern American states normally known as the Solid South and where the legislators and voters were known as “Dixiecrats” who were abandoning the “liberal” Democratic Party. The Solid South, he correctly stated, was voting more conservative. And that meant voting for Republicans – heretofore-genealogical taboo in the South. It was beginning to invade Minnesota when I was an undergraduate. As I said, I was in college in the Twin Cities and noticing that the traditional northern European immigrant stock (i.e. white) that I was a member of was beginning to agitate against Minnesota’s generous tax rate because they were beginning to “feel” that the state government, which guarantees social programs to one and all, was infringing on their “personal freedoms.” The immigrant safety net of our populist state government that historically protected all its inhabitants was starting to become an embarrassment its new middle class. Minnesotans were also abandoning the labor unions that protected a collective quality of living. The democratic coalitions that created the American middle class were now too passe. Not needed. The sons and daughters of farmers and miners and teamsters now had their homes in suburban White Bear Lake and Edina and were sending their kids to Harvard and Macalester College and Gustavus Adolphus and weren’t really interested in that old-fashioned, “stick-it-to-the-corporations” tax rate. Sons and daughters of men and women who had reaped the fruits of the G.I. bill to obtain an education were now taught to rally against the “welfare state.” We Minnesotans were dangerously on the verge of becoming the Babbitt-like hucksters predicted by native son novelist Sinclair Lewis in the 1920’s and 30’s, low level company front men who would dictate the corporate agenda of lower taxes. Minnesotans were hankering to take back that extra buck or two of safety net tax dollars instead of evoking the traditional welcome mat to an ongoing wave of new immigrants who, by the way, were not necessarily European and white. Hell, we had fishing boats and snowmobiles to buy. The DFL and Uncle Sam sure as hell weren’t going to tell us what to do! In this climate there would never have been an iron ore tax. A large part of what I do for a living is to ensure that political candidates in California support issues and legislation that help working men and women. Working men and women who, now more often than not, work for companies that really don’t want workers to have a voice at work about their wages and rules and work week schedules. Walter Mondale was supposed to continue Paul Wellstone’s legacy. A good irony. Paul Wellstone continued Walter Mondale’s legacy the same way that Walter Mondale continued Hubert Humphrey’s legacy. And because I had a good Minnesota education I can still remember that Hubert Humphrey continued Floyd Benson’s legacy and maybe I should be clear about what that means. It means getting into public office to make sure that lumber, mining and corporate interests shared their earnings with the wage earners who ensure industry’s success. The history of modern Minnesota is a proud history. It’s a short history and its main accomplishment is the cobbling together of a middle class. And the coalition of labor, faith and community groups that just succeeded in raising the minimum wage with cost of living indexing shows that the flame is still alive. Scandinavians will continue to define Minnesota and its legacies and keep their museums and historical journals while new immigrants like the Somalis, who I’m told have found a niche for work as security officers in Twin City office buildings, should be expected and encouraged to continue their legacies when they, also, emigrate to a foreign nation and state. The legal troubles they recently incurred when they tried to form a union is nothing short of what immigrant Finnish miners encountered when they asked for more job protection and living wages in the 1920’s on the Iron Range. All that is good about Minnesota is really encountered in the fights that never end. But in the end the legacy of my native state is that “Minnesotans take care of Minnesotans.” Minnesotans don’t want to be known as individuals and ski jumpers but really work best when part of a team. And I should note that, like California, Minnesota has a Democratic governor and majority in both legislative houses. I wonder if Virginia’s Tommy Rukavina regrets not running for re-election since he would now be full chair of a committee or two. But we are on the way to taking back America for the 99 percent. 2014 might not get the Congress back. But we are on the way. By the way, I came in fourth from last in ski jumping at the Minnesota State Ski Tournament. I was 17 years old. I flew. I was exhilarated. I almost killed myself. Tim Paulson is the Executive Director of the San Francisco Labor Council, AFL-CIO, which represents over 100 unions and their 100,000 members. He was Vice-President of the San Francisco Building Trades Council and is a Journeyman Tile setter and member of Bricklayers and Allied Craftworkers Local 3 California. Tim attended high school in Virginia, Minnesota and Macalester College in St. Paul before moving to California in the late 1970’s. He was the Political Director and Assistant Secretary-Treasurer of the San Mateo County Central Labor Council, AFL-CIO, when he began this article after Paul Wellstone’s death. This entry was posted on Thursday, May 15th, 2014 at 10:16 pm	and is filed under Blog. You can follow any responses to this entry through the RSS 2.0 feed. Both comments and pings are currently closed.